In my book Fretboard Theory and its related video program, I teach the pentatonic scale as five separate patterns. These patterns cover every position on the neck and connect together to make one giant fretboard pattern. This method is how many guitar players initially learn pentatonic scales. But when it comes to actually using the scale to play melodies, riffs, lead guitar solos, and bass lines, it’s not necessary to utilize every position or every part of every pattern. Most guitar players, including some of the most famous ones, favor only a few particular sections of these different patterns that work well together. When viewed together, these sections are sometimes called lead patterns. 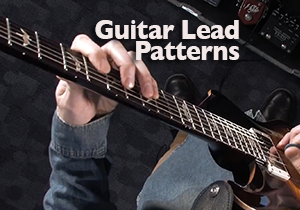 Lead patterns make it easier for you to keep track of the root note of a chord, shift from position to position, duplicate licks in different registers, and use the first three, and strongest fingers of your fretting hand. You will also be able to find your way around the neck better, becoming more proficient at what you play as you narrow your focus to a few essential patterns. In Fretboard Theory Volume II Chapter 6 I am going to teach you two lead patterns, each one having a major and a minor form. In the following chapters you will see how these lead patterns are filled in with major scales, harmonic minor scales, modes and arpeggio patterns. 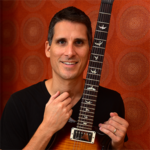 To get all the details about this guitar theory program, visit the Fretboard Theory page. You can purchase DVDs from Amazon’s U.S. website. The discs are not stocked in the UK. I have borrowed the Guitar Theory for Dummies book from public library. I’m very interested in purchasing a real copy for my own to explore further…you seem to also have the Guitar Theory e-books (Part 1 and 2). I’m looking over both products and they seem to be the same. Which one is the updated and/or better one to purchase? Also can you elaborate on the differences between the two since they look like the same content from my comparison.